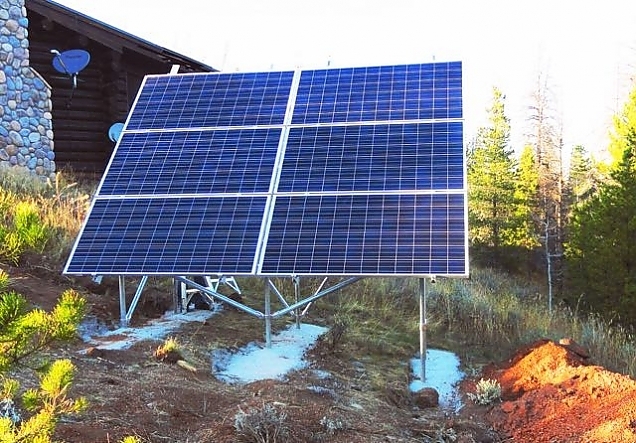 I posted a lengthy article about our off-the-grid utilities earlier. In that article I said we'd need to add some additional PV charging capacity in order to be able to live at the cabin full-time. First, earlier this summer the new batteries did get installed. We now have 12 batteries instead of 8, and since they are new we should have significantly more storage capacity. Our new solar panels are finally installed! And, at the end of last week, the new PV panels were finally installed. It has been a nightmare trying to locate contractors to do the excavation work, trenching and concrete work needed. The front range of Colorado is undergoing a huge growth spurt and contractors are simply not interested in small jobs that are two hours away. Sam at Burham & Sun finally got some people to do the work and the panels are mounted. This week, she will lay the conduit and cables, wire the panels into a charge controller and hook them up to the batteries. The next step in our need for additional power is to re-install the wind turbine. I bet that will be an interesting adventure, too.